Because access to arts instruction consistently improves graduation rates. Regular participation in school-based arts programs improves attendance and can improve grades, even for non-arts classes. Music instruction improves math skills, develops discipline and fosters cooperative achievement. Instruction in visual art improves the intuitive understanding of spatial relationships, instills good design principles and expands the part of the brain responsible for innovation and creative problem solving. These are skill sets that business researchers say will be needed every day by our future employees and employers, even if they never pick up another instrument or paint brush after they graduate. Do we want scientists who cannot distill their findings into simple, effective visual presentations? Do we want public policy makers who cannot present their proposals with clear, compelling public presentations that inspire confidence in the projects that secure the future of our community? Do we want engineers who are not practiced in collaborative creation? Do we want bankers who have no empathy? Do we want civic leaders without the poise, discipline and persuasiveness to create positive change? The question of whether to restore arts education to the schools is not about whether we “need” more artists. It’s not a question of whether we can “afford” the luxury of a culturally educated populace. The question is whether we “need” our future Portland employees, business people and civic leaders to have practiced the skills and values that are more effectively taught through arts education than through any other process. Yes, I think participation in the creative disciplines can transform cultures and communities. Yes, I think arts participation is fun. And creates more cultured citizens. And inspires future artists and future audiences. But I don’t think you should vote for the CAN initiative to create more artists and audiences in Portland. I think you should vote for it so that the decision makers that will one day be running Portland businesses and institutions will be practiced in the art of creating cooperative, innovative, well-designed solutions that demonstrate empathy and are communicated with self-confidence, persuasiveness and poise. I think that’s worth $35 a year. And if those decision makers also become more musical, with a deep capacity for the creation and enjoyment of beauty in all its forms – thereby improving the overall well-being of Portland’s citizens – then let’s just call that a bonus. Shall we? 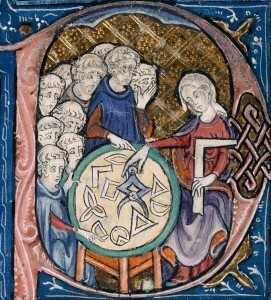 ILLUSTRATION: Science meets art: Woman teaching Euclidean geometry in 14th century painting. 1309 – 1316, France; The British Library. Previous PostMary don’t you weep, don’t you mournNext PostLink: Bartow carves a notch in D.C.